Just a quarter of Latino registered voters say they approve of President Donald Trump's job performance in a new NBC News/WSJ/Telemundo poll. WASHINGTON — Just a quarter of Latinos approve of the job Donald Trump is doing as president, and Latinos prefer a Congress controlled by Democrats rather than by Republicans by a three-to-one margin, according a new NBC News/Wall Street Journal/Telemundo poll. But Latinos also still report less interest in the upcoming midterms than the electorate as a whole, presenting a challenge for Democrats as they try to mobilize a coalition that can win in diverse districts nationwide. The survey, which included a sample of 300 Latino registered voters, found that just 26 percent approve of Trump’s job performance, compared with 65 percent who disapprove — with 50 percent disapproving strongly. Even among Latinos who identify themselves as ideologically conservative, only half give Trump a thumbs up, while 44 percent disapprove of his performance. That’s compared with eight-in-10 self-described conservatives overall who approve of the job Trump is doing. The unpopularity of Trump and his political positions among Latinos could give Democrats a boost in the 2018 midterms — if Latino voters go to the polls in November. Asked about their preferences for party control of Congress, 64 percent of Latinos said they’d like to see Democrats in charge, compared with 21 percent who prefer Republicans — a margin of 43 percentage points. That's a higher margin of preference for Democrats than Latinos had in September of 2016 (34 percentage points) or September 2014 (33 percentage points), but slightly narrower than before the 2012 presidential election (45 percentage points). 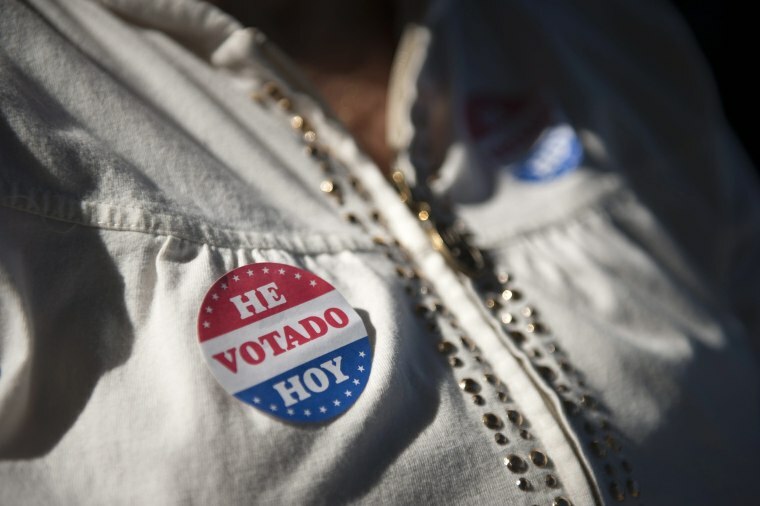 More than half of Latinos — 53 percent — say that they want their vote to send a signal in favor of more Democrats to be a check and balance to Trump and congressional Republicans. Just 18 percent want to send a message in favor of Republicans who will advance Trump’s agenda. Still, one looming problem for Democrats is that Latinos remain less interested in the 2018 midterm elections than the electorate at large. About half — 49 percent — report the highest level of interest in the upcoming midterms, compared with 61 percent of white voters and 58 percent of voters overall. Interest in the election is particularly low among younger Latinos. Just 43 percent of those under 40 are highly engaged as the midterms approach. The survey, which was conducted in English and Spanish, found that Latinos’ sour views of the president also apply to his party. Just 22 percent give the GOP positive marks, while 45 percent disagree. Similar margins persist for both Latinos under 40 (20 percent positive/47 percent negative) and over 40 (24 percent positive/44 percent negative). By contrast, Latinos have relatively positive views of the Democratic party, with 46 percent reporting positive views and 20 percent reporting negative ones. But younger Latinos are more skeptical of the party overall (39 percent positive, 26 percent negative) compared with their counterparts over 40 (52 percent positive/15 percent negative). What’s more, by a wide margin, Latinos say that Republican elected officials have failed to address the concerns of the Latino community. Just 26 percent say their concerns have been addressed well by the GOP while 69 percent say they have not been addressed well. Their perception of Democrats’ engagement with their communities is rosier. Fifty-three percent of Latinos say Democratic elected officials have addressed their concerns well, while 38 percent disagree. Latinos are also more receptive than the electorate at large to Democratic messaging, particularly regarding immigration. More than six-in-10 Latinos (63 percent) say they would be less likely to support a candidate who favors building a wall on the U.S.-Mexico border, while 55 percent of voters overall say the same. While 58 percent of all registered voters say they would be more likely to support a candidate who favors legal status for DREAMers who were brought to this country illegally by their parents at a young age, fully 77 percent of Latino voters say the same. And one-third say they would be more likely to support a candidate who backs abolishing the Immigration and Customs Enforcement agency, while 36 percent say they’d be less likely to vote for that candidate (net -3). That’s compared with about a 2-1 preference among all voters to vote against a candidate who supports abolishing ICE (net -23). The oversample of 300 Latino registered voters was conducted Sept. 16-19, 2018. Interviews were conducted in both English and Spanish. The margin of error for all Latino voters is +/- 5.66 percent.